Library Student Journal (LSJ) is an international Open Access (OA) student journal. We publish essays, book reviews, editorials, and peer-reviewed articles from Library and Information Science (LIS) students worldwide, and encourage active participation from anyone wanting hands-on experience with OA publishing. OA has big implications for the LIS field and it is important that LIS students be familiar with this emerging new model of scholarly communication. 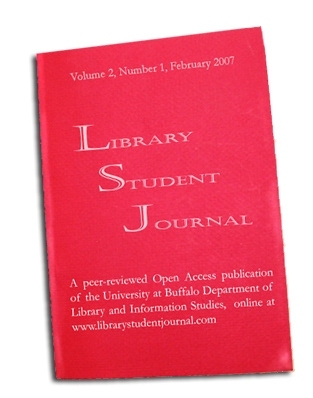 LSJ was first conceived as a small in-house print journal for students in the Department of Library and Information Studies at the University at Buffalo (UB) in Buffalo, New York. The project took on a national scope when it became apparent from our preliminary research that LIS student publishing included no large-scale North American journals—though attempts had been made in the past, none were still in existence (most notably, The Katharine Sharp Review was an early online LIS student journal and had a lot of success from 1995 to 1999). We eventually dropped the idea for a print version altogether and embraced an online-only Open Access model. This shift in thinking caused us to think internationally rather than focus on North America; it has since been our goal to have participation from all areas of the world and we try to encourage the sharing of ideas and experiences across political boundaries. Our first call for Editorial Board members in early 2006 resulted in a tremendous response from many passionate and enthusiastic LIS students. Any doubts we had that there would be interest in such a journal were quickly forgotten, and since then we have never lacked for submissions, volunteers, and general good will. We now have a 25-member Editorial Board, and dozens of peer-review and book review volunteers from around the world. Every day we hear from students wanting to be involved in one way or another, and it is heartening to see so much interest in student publishing. The submissions we receive are on a very wide variety of LIS topics, but are generally very forward-thinking and attempt to add a new perspective on an old topic or to bring new information to the peer-reviewed literature of the field. Email and the widespread use of computers and the internet make it easy to quickly reach readers in places that would have been nearly impossible even a few years ago. A single email announcing a new issue, for instance, might be posted to the JESSE listserv one day and be referenced the next day in blogs from Japan, New Zealand, and Germany the next—which has made marketing rather easy for us, though we may do worry that we are only reaching those who read blogs and subscribe to listservs. We like to think there is a way for all LIS students to participate in LSJ. As authors, editors, proofreaders, reviewers, or even just as readers, we happily welcome participation from enthusiastic LIS students and encourage discussion on topics raised in the “pages” of LSJ. We have a monthly poll, an Editors’ blog, a listserv, and a discussion forum for those wanting to further discuss any issues raised by published papers. This field is quickly evolving with new issues emerging all the time. It is important that we share new perspectives and ideas across borders and boundaries. As we near graduation—those of us left from the founding staff, that is—our attention is focused on finding ways to ensure the long-term survival of LSJ, to give new LIS students a chance to build something greater on the foundation we’ve laid. LSJ has published three “issues” but will henceforth be publishing on a continuous schedule—we will be releasing papers as soon as they are ready for publication (at a rate of approximately one paper per week) rather than publishing several papers at once a few times a year. This change will accomplish two things. First, it will allow us to publish papers in a more timely manner—articles on a very current topic will no longer have to wait for the next issue to be made public. Second, by eliminating deadlines the stress on our unpaid, overburdened staff will be drastically lowered—the importance of which, for the long-term survival of a journal of this type, cannot be overemphasized. To better deal with a large number of submissions, we will soon be moving to an Open Journal Systems (OJS) journal management system. OJS, developed by the Public Knowledge Project (http://pkp.sfu.ca/), is extremely popular among Open Access journals for its usability and its price tag (it is open source and thus free). The move will increase our general efficiency and will allow us to more easily track each paper as it moves through the many steps of the peer review and editing process. And it will allow us to take a step towards being truly international. For our development into a publication that represents the views and concerns of LIS students worldwide, we feel it is important that our editorials staff be open to all LIS students worldwide. As we look to fill positions opened by graduating staff members in the coming months, we will be advertising internationally. We will be accepting applications from those interested in being Editor-in-Chief, Section Editor, Copyeditor, Proofreader, and Web Editor. Members of the current staff, including myself, will continue to act as “publisher” for the foreseeable future—to provide consistency and stability in the coming years we will take care of funding and technical issues, and advertise for open positions as they become available—but we will be handing over all editing and day-to-day operation. Open Access (OA) is much more than a general notion that information should be widely available—it is a very specific movement with serious implications for the Library and Information Science (LIS) field, and nobody is in a better position to affect its development, for better or worse, than librarians. Yet most LIS practitioners and faculty have only a vague idea of what OA is, and few fully understand the potential impact this new way of distributing scholarly information might have. Two futures now exist. In one, librarians are dismissive of the OA movement, react to it too slowly, and find that their relevance and their budgets have been greatly diminished. In the other, librarians take the initiative to be an active player in the development of OA, work with scholars and publishers to address some of the important new issues it raises, and find themselves in a position of new relevance in the digital age. Which future will happen largely depends on the current LIS student population. Current OA LIS student journals have an important role in introducing the concept of OA to future faculty and practitioners, modeling a system of scholarly communication that has a large potential for librarian involvement. The emergence of LIBREAS.Library Ideas in 2005 and LSJ in 2006 has provided LIS students around the world with working models of OA publishing, an important new dimension to the more obvious goal of providing a forum for students to share ideas and showcase their work. Many current students will, in the coming years, find themselves in the position to support OA publishing. A young systems librarian at an academic library will be asked if he is willing to install and maintain an OJS system. A new library director will consider a request to dedicate a substantial portion of her limited budget, staff time, and server space to an upstart OA project. A reference librarian will notice a need for better communication of scholarly information in their area of expertise and will consider founding an OA journal. If those young librarians can appreciate the implications of OA, can see the bigger picture and recognize the opportunity, there will be sufficient incentive for most of them to make at least a small investment and for a few of them to make a big investment. If they do, the future will be brighter for Open Access. If they do, the future will be brighter for librarianship. Eli Guinnee ist Chefredakteur des Library Student Journal und redigiert für die elektronische Zeitschrift Information Research. Er war an der Morgan Library der Colorado State University und für die Nationalbibliothek von Schottland tätig und studiert gegenwärtig im Masterstudiengang Bibliothekswissenschaft an der Universität Buffalo.